The Medical College Admissions Test (MCAT) is the standardized test mandatory for all traditional allopathic and osteopathic medical schools. It is also recommended for some PA programs. Provided by the Association of American Medical Colleges (AAMC), the MCAT helps admissions committees compare students by a single metric. Furthermore, in the past, particular MCAT scores have correlated with passing medical licensing exams like USMLE (United States Medical Licensing Examination). Although it may seem intimidating, the MCAT is certainly manageable if you know how to prepare. What is on the MCAT? As you may be able to tell, the MCAT is heavy on science, which is why many students that apply to medical school are science majors. For a full breakdown of exact content, click here. The most common advice is to take the MCAT when you have taken all of the courses that will be on the MCAT. The absolute last date to take the MCAT is the summer you apply to medical school - for those not taking a gap year, this is the summer after your junior year. You need the results of your score to be available by the submission deadline (read more here). The most common time to take the examination is in the spring of your junior year or the early summer after your junior year. If you want to have the option to take the exam at least twice, then you should take your first MCAT no later than April (maybe May) when you're applying to medical school. That way you could take another exam in June. Keep in mind you will not know what you made on the exam immediately, and you typically have to wait a month for results. Basically, take the exam when you are ready, but keep in mind submission deadlines. We advise taking it as early as possible when you've taken all the courses necessary to prepare. First, we advise taking the courses on the MCAT at Clemson, even if you have credit for these courses from high school. Depending on your major, you may take many of the courses (to the right) while you are completing your major requirements. We strongly recommend taking these prerequisites before taking the MCAT. While these courses will surely help you to ace the MCAT, you should review these courses before taking the exam, which leads us into our next topic - extracurricular preparation. No matter how you choose to study, you still must study quite a bit. Many members that perform exceptionally well put in between 100-300 hours to study for the MCAT. This is the biggest test you have taken in your life at this point, so be encouraged by the challenge and prepare yourself by studying specifically for the MCAT. There are a LOT of test prep companies out there. Keep in mind, no matter how much money you spend on test prep, in the end, you will have to study. We do not endorse any particular company, but many of our successful members tend to stick with popular companies (Kaplan, ExamKrackers, etc.) and perform exceptionally well. In the end, only you know how you study best. We strongly recommend purchasing some kind of review books. If you are driven and can set aside time to study productively, then we think self-study can suffice. However, in studying for an exam this large, it is easy to study the things you know well and leave the things that you do not know for later. Make sure to honestly address your weak points when self-studying. Using review books and practice exams are the best way to track your progress! If you struggle to hold yourself accountable to a study schedule, then a course can keep you on track. Online or in-person courses often have study schedules available to ensure you hit each of the major topics you need. Review courses also have extra resources including additional test questions, testing analyses, online live chats, and more. These resources may be helpful if you feel review books and tests are not enough. If you are trying to conserve money then you need to plan ahead. Try the self-study plan for your first MCAT, and if you do not perform your best, then try a course. Tried and true, this test prep king harbors various forms of test preparation. Many of our members use solely Kaplan to study. Kaplan courses include Private Tutoring ($3,999), In Person ($2,229), Live Online ($2,229), & Self-Paced ($1,999) - prices may vary. All courses come with 11 full-length exams, over 8,000+ MCAT practice items, and the most available official AAMC practice resources. Kaplan courses utilize SmartReports, which gives students in-depth insights into strengths and weaknesses on the MCAT with recommended instruction. Please note that Clemson AED members receive 10% off of Kaplan courses. Contact us to receive the discount. Kaplan self-study offers stand alone review books + 3 practice tests ($160). Looking to get started right away? Try their MCAT Question of the Day (Free), which gets sent to you via email daily. If you've got a little more time on your hands work in Kaplan's 20-Minute Workout (Free). The AAMC has partnered with Khan academy to create the Khan Academy MCAT Video Collection, which covers all the content that will be tested on the MCAT. With more than 900 free videos & 2,000 review questions is an excellent resource for explanations on topics you might not quite get. Great all-around, but superb as an additional resource for self-study. ExamKrackers, always referred to as "EK," has been cited as one of the best "MCAT Think" perspective. EK focuses not only on content, but also on how the MCAT asks questions. EK tells you what you really need to know. Its MCAT Comprehensive Live Online Course ($2,199) provides 115 hours of live online instruction over nine weeks of evening and weekend classes. EK's most popular area is its self-study review books ($190). EK also offers a Daily Question (Free). Another Test Prep giant, The Princeton Review offers Ultimate ($2,399), Cram Pack ($1,999), and Self-Paced ($1,899). *AED members now get $200 off for any Princeton Review single course tuition. Contact the Pre-Medical Director for more information. Although a bit more old-style, Berkeley provides a rigorous content review. If you are really having a difficult time remembering information from Clemson classes, then perhaps check out these books. The Berkeley Review books are in total 9 books ($330); however, only Biology I ($69) & Biology II ($69) are updated for the new 2015 version of the MCAT. They also offer 3 computer based tests (see right). Gold Standard MCAT offers a MCAT Crash Course ($49.95/month) and MCAT University ($79.95/month). The crash course includes 2 full length exams, more than 2000 practice questions with solutions, and 60 hours online MCAT videos. Its full-fledged program - MCAT University - includes 4 full-length exams, 5 CARS practice tests, and more than 3000 practice questions. They also have Physics Equation Sheets (Free). While there are many, many companies that would gladly let you subscribe to their programs, take time to review which preparation style is best for you. Again, money cannot produce a good MCAT score. Only you can do that. Ask other members how they have successfully studied for the MCAT. Each section of the MCAT is scored from a low of 118 to a high of 132. Considering there are four sections, that means scores range from 472 to 528 with 500 in the middle. 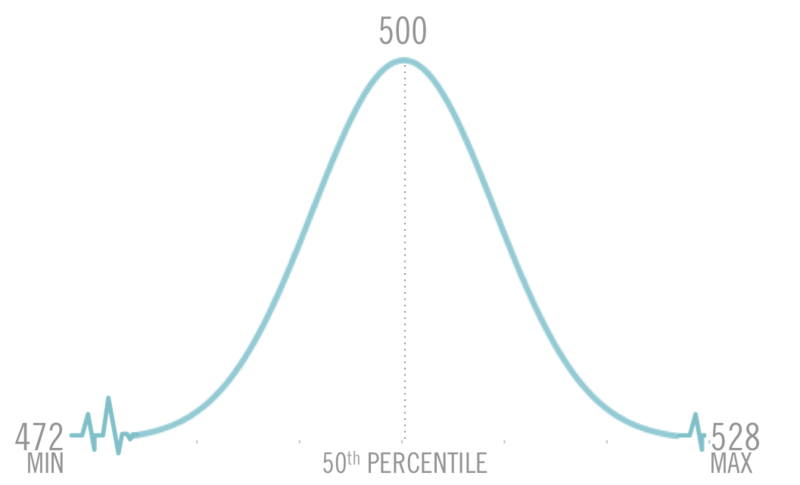 Scoring is "normalized"; therefore, a score of 500 means you are in the 50th percentile. It is harder to move a few points toward the middle than the extremes. For a detailed explanation of scoring, click here. We say shoot for the 70th percentile or above, which comes out to 505-506 or higher. This score translates to a 28-29 on the old scoring system. These numbers are subject to change as admissions committees choose their new classes. Check past scores of the medical school you are applying to in order to be sure. MCAT® is a registered trademark of the AAMC, which does not endorse the contents of this website.